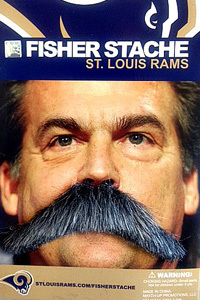 Jeff Fisher was highly touted to be the next coach of the Miami Dolphins, but after a brief courtship, Fisher rejected the offer on the table and took the job in St. Louis, much to the dismay of many a Dolphin fan. We were left wondering who would take the helm of our beloved organization. Around the league we were being scorned, from tweets and remarks from players like Joey Porter, to the media and our own fanbase picketing outside the offices and hiring private propeller planes asking Stephen Ross to fire Ireland. 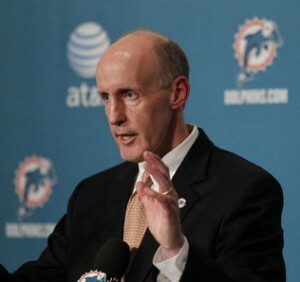 It seemed like dark days indeed, until Joe Philbin emerged to take up the challenge of getting our team back on course and steering us in the way of respectability. So far he seems to be on the right track – I have not agreed with everything he has done, but then again I am not down at the practice facility every day keeping a watchful eye on everything like he is. It really does feel like a plan is starting to come together, so as we settle in for what will be a thrilling encounter, I am sure I can’t help but wonder which team got the better coach to move the franchise forward? Right now I am betting on Stephen Ross and his man Philbin. This Sunday, the St. Louis Rams face off against the Miami Dolphins in Miami. Playing in front of a home crowd with growing expectations by the week, this game presents the Phins with a great opportunity to move to .500 on the season and put the AFC East very much back in contention heading into their bye week. This is a real chance to get some momentum. We have looked every bit the part of a contender for most of the season but for a few sloppy mistakes where we turned the ball over. That, there has killed us, ending potentially great drives (something we have seen a bit of already this season), but worse, allowing our opposition to put points on the board and stick around in games where we were the better team for the majority of the game. But in any sport, it is never really about the team that played the best for most of the game, it is about the team who took their chances when they got them and made the most of them. The Dolphins have not. Until last week, that is. 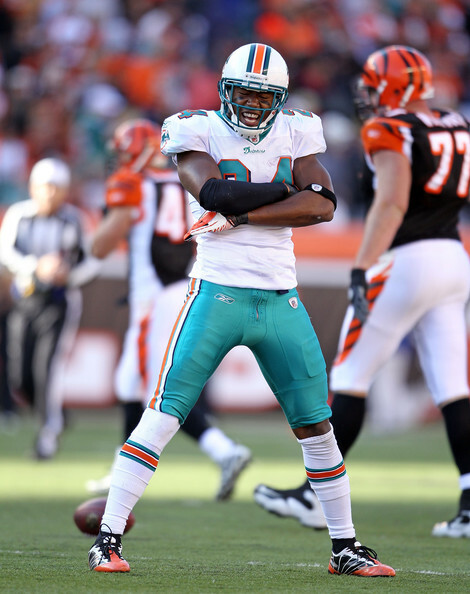 We saw the Dolphins force more turnovers than the Bengals, and what happened? We were able to win the game. Well done to a very great defensive effort here, especially you, Mr. Randy Starks. Great pressure throughout, and not only did you get your hands up on that pass but you managed to hang on to it – absolutely fantastic. Sean Smith is like a different player so far this season and Reshard Jones has stepped up big time, he was everywhere last week and his contribution in stuffing the run was inspired. Last season, Vontae Davis claimed that he was one-half of the NFL’s best cornerback tandem. Today, the Dolphins traded the 24-year-old to the Indianapolis Colts for a second and a conditional sixth round draft pick, according to Jay Glazer of Fox Sports. â€œWe appreciate all the contributions Vontae has made to the Dolphins since we drafted him in 2009 and we want to wish him the best of success in Indianapolis,â€ said GM Jeff Ireland in a press release. 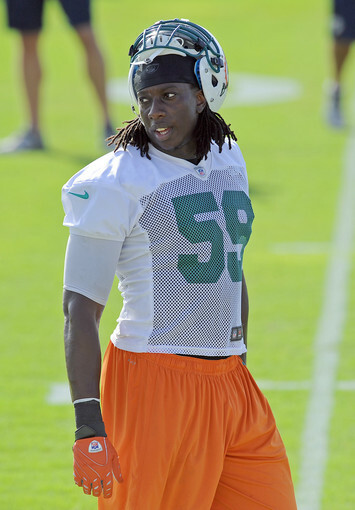 Davis,Â drafted 25th overall in 2009, had started 36 games of 44 games for Miami over three seasons, racking up 143 tackles, nine interceptions — including a team-high four in 2011 — and one sack, but never seemed to get on the right track with the new coaching staff, who questioned his maturity and conditioning. Davis had already lost his starting job to free agent pickup Richard Marshall, and the Hard Knocks cameras showed Coach Joe Philbin pulling No. 21 aside for his unprofessional behavior during training camp. 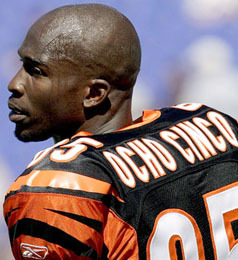 Having already dealt Brandon Marshall for a pair of third-round picks and released Chad Johnson during the offseason, the front office and coaching staff have shown a commitment to high character, but have also done little to replace three of their most skilled players on the field in the short-term (Terrell Owens, anyone?) while starting a rookie quarterback who has been up-and-down in the preseason. While picking up future assets is essential for a rebuilding team, in Davis, the Dolphins are giving up on another young player with Pro Bowl-caliber talent, while also losing significant depth at cornerback, where Marshall, Sean Smith and Nolan Carroll are the only players with veteran experience. 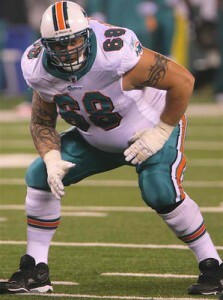 After losing their first seven games to begin last season, there might be a sense of dÃ©jÃ vu in South Florida in 2012. Best of luck to Davis, who will get a chance to face his former team in Week 9 at Indianapolis. On Wednesday, the Miami Dolphins hosted a live chat with linebacker Gary Guyton, the third call set up exclusively for the fan websites invited by the team to attend the annual Web Weekend. Guyton — who went undrafted in 2008 despite having the fastest 40-yard time at his position at the NFL Combine (4.47) — spent his first four seasons with the New England Patriots, starting 32 games, including all 16 contests in 2009 when he had 85 tackles and 1.5 sacks. Over the last two years, the 6-foot-3 LB recorded 110 total tackles, three sacks and three interceptions, including one pick-six. Following him on Twitter:Â @GaryGuyton59. In addition to talking about his transition to a new coaching staff and defensive scheme, Guyton, as well as a member of the Dolphins Cycling Challenge staff,Â encouraged everyone to get involved in the third annual DCC, a two-day, 170-mile charity cycling event to benefit the Sylvester Comprehensive Cancer Center, on November 3 and 4. Both of Guyton’s parents are cancer survivors and he recently lost his grandmother to the disease, making the support the DCC gives to cancer research — $1.6 million raised over the last two years, with a goal of doubling that amount this season — a very important cause to him. Please go to RideDCC.comÂ to register as a rider, volunteer or a virtual rider; clickÂ hereÂ to help raise money in memory of our friend Tom Eddie. On the football field, Guyton has been pleased with the continued growth and development of the Dolphins while putting in the long hours in preparation for the upcoming season. Coming over from New England, he talked to DolfansNYC* about theÂ Â difference in coaching styles between the two organizations. “(They’re) great coaches â€“ all of them on both sides of the ball are very knowledgeable in the game,” he said. “Getting in here, learning other things you may not have picked up from other coaches, it all helps you be a better player. No. 59 also told us that all of the Dolphins’ tight ends, led by the veteran Anthony Fasano, have been tough to cover. On Friday, the Miami Dolphins hosted a live chat with cornerback Sean Smith — the second call of the offseason exclusively for the fan websites invited by the team to attend the annual Web Weekend. 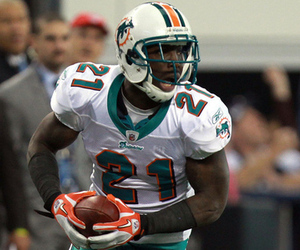 Smith, the 61st overall pick in the 2009 NFL Draft, has started 40 of the 47 games games he’s played during his three seasons in Miami, coming up with three interceptions. Last season, No. 24 tied for second on the team with a career-high two picks and registered 51 tackles. Make sure to follow Smith on Twitter: @SeanSMITH24. Over the course of the 10-minute call, the 6-foot-3 CB discussed the impact of new defensive coordinator Kevin Coyle on the secondary, his new role as a mentor and leader, and, like Richie Incognito last week, told DolfansNYC that he takes great pride in seeing fans clad in aqua-and-orange in New York New Jersey and other opposing stadiums. “It means a lot, because we definitely appreciate the fan support,” said Smith. “Whenever youâ€™re on the road, youâ€™re always the villain — youâ€™re getting booed no matter what you do — so itâ€™s always good to have that one section you can look up to (where) you get the fans screaming in aqua-and-orange. With long-time veteran Yeremiah Bell no longer on the team, Smith told us he has taken on the role of mentor to not only the younger players, but some of his more-established teammates. Smith explained that he doesn’t just want to give himself the title of being the leader of the secondary, but rather earn it on the field. “I just go out there and do my job the best way I can and try to show the guys the right way to do things,” he said. Smith also touched on numerous key topics,Â includingÂ his offseason routine, his expectations for the up-and-coming Phins wide receivers, and adjustments to the new defensive scheme. Last night, newly-hired Miami Dolphins head coach Joe Philbin participated in a teleconference call with the team’s season ticket members, and DolfansNYC had the opportunity to listen in on the interesting Q&A session. During the 45-minute call, Philbin touched on a variety of topics, ranging from the team’s biggest needs in the upcoming Draft to his visions for the offense, openly asking the fans to have “faith and confidence” that he will deliver results in 2012. *Philbin said heâ€™s happy with three quarterbacks on the roster –Â Matt Moore, David Garrard and Pat Devlin –Â and praised Moore and Garrard for being proven, winning players. He did, however, note that the starting job is still a wide-open competition between all three QBs. â€œWe havenâ€™t promised anyone anything,â€ he said, suggesting that the winner may be the player who learns the offense the quickest and exhibits the most comfort in the system. *Regarding the Draft, in which the Dolphins have the 8th overall pick,Â Philbin disclosed the Dolphins are in final preparationsÂ and that the team’s biggest needs are at pass rusher and wide receiver (somewhat surprisingly, not QB). *As for Miami’s receivers, a topic which was understandably asked about several times during the call,Â Philbin reiterated he plans to develop the current corps on the roster — includingÂ Clyde Gates, Roberto Wallace, Julius PruittÂ — but noted the Dolphins may still bring in a free agent. *Phiblin hopes to take advantage of Reggie Bush‘sÂ talent and versatility and use him at running back, as well as wide receiver, in different formations to create more mismatches for opposing defenses. â€œWith Reggie, we want to be multiple â€“ we’re not just going to hand the ball to him,â€ he said. *Philbin said while theÂ West Coast Offense has a lot of unpredictability and that the ball will be spread around, the Wildcat is not a likely option. *Philbinâ€™s praised the coaching staff, including offensive coordinator Mike Sherman and defensive coordinator Kevin Coyle, and revealed that the team will use a more collaborative approach in calling games. â€œThis is not going to be a one-man operation on any side of the ball,â€ he said. *Philbin declined to predict whether the Dolphins will make the playoffs or his expected win-total, stating,Â â€œyouâ€™re never totally sure exactly what you haveâ€ with the roster. All in all, the head coach offered an intriguing inside look into the team’s plans and philosophy in the first of several calls that he, as well as ownerÂ Stephen Ross,Â will hold this offseason with Dolphins the season-ticket holders.